Ding ding! Round two. Back in September 2015, I had the pleasure of judging the inaugural Battle of the Blends. 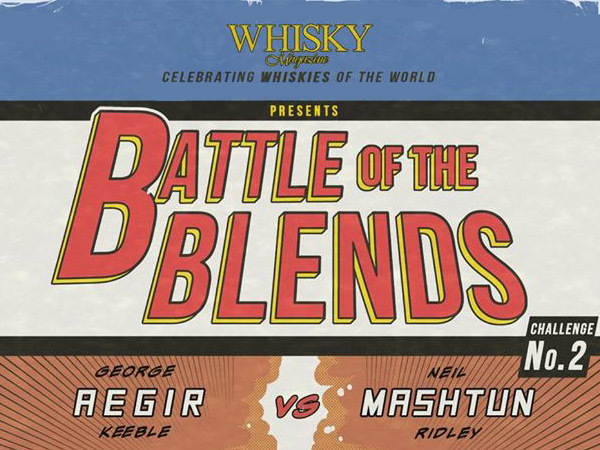 The battle saw Whisky Magazine and Master of the Malt pit whisky aficionados Dave Broom and Neil Ridley against each other, to see who could come up with the best blends. Neil came out on top, with Dave KO’d. And now, we’re back for round two! Neil now has a challenger to his title – George “Aegir” Keeble. However, the rules for this second bout are the same as before. Each amateur blender started out with a 20-litre first fill American oak cask, which had previously been filled with high strength neutral spirit. Neil then seasoned his cask with port, with George opting for Oloroso sherry. The blends had to comprise of a whisky from each of Scotland’s whisky-making regions; no bottle of whisky used must cost more than £50 RRP and must be available in the UK; and there must be at least one grain whisky. One wildcard whisky, which couldn’t be over £150 RRP, could also be used. Auchentoshan Three Wood, Springbank 10 Years Old, Ardbeg Uigeadail, Lagavulin 16 Years Old, Glenfiddich 12 Years Old, Glenfiddich 15 Years Old, Glenfiddich 18 Years Old, Teeling Single Grain and Royal Brackla 12 Years Old. Glen Scotia Double Cask, Glenkinchie Distillers 2003 (Amontillado Finish), Finlaggan Cask Strength, Kavalan Solist Sherry, Tullibardine 228, Glen Moray 16 Years Old, Benromach 10 Years Old, Glenfarclas 15 Years Old, Bruichladdich Classic and Teeling Single Grain. This is so much closer than last year, but Blend A just pushes it for me. It’s warm and inviting on the nose – lots of raisins and sultanas, with some chewy vanilla fudge. I think there’s a touch of banana in there too. And there’s a good wisp of smoke coming through. The palate is robust, with soft stone fruits and some gentle spice, with the smoke creeping out towards the end. Blend B was still cracking but the smoky edge of Blend A just pushed it for me. For the second year, I think Blend A belongs to Neil, especially as the smoke reminds me of Ardbeg more than it does Bruichladdich. But what do the results say? Blends A! Again. With 58% of the vote, compared to 59% last year. However, it turns out that Blend A actually belongs to George. Clearly I need to work on my Islay whiskies! Thanks to Whisky Magazine and Master of Malt for allowing me to take part in Battle of the Blends by providing the whiskies.